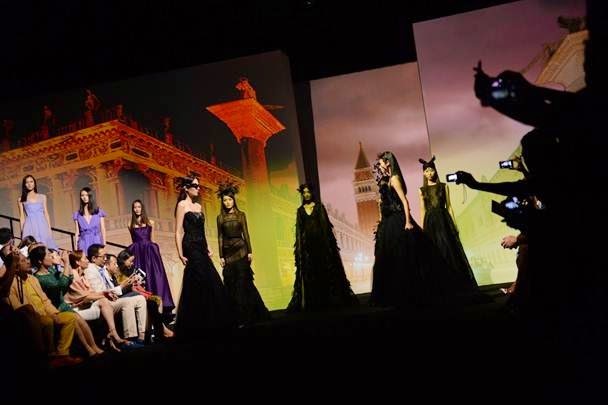 On October 20, 2014 Alberta Ferretti opened Shanghai Fashion Week as international guest of honor. The event was held on the main stage of Taipinghu park in Shanghai Xintiandi. The Alberta Ferretti Spring/Summer 2015 and Forever Bridal 2015 collections were shown, as well as a capsule collection created specifically for this occasion. 700 guests including celebrities, socialites, international editors, bloggers and top clients from all over Asia attended the event. Most notably, Chinese actress Gao Yuanyuan, known for her internationally and critically acclaimed films “City of Life and Death” and “Don’t go breaking my heart”, the latter garnering her a best actress award at the 31st Annual Film Festival of Hong Kong. Special thanks to Nanà Firenze for the conception and execution of the special feathered headpieces.